I’ve always wanted to be a “lady who lunches,” but I’m just not that sophisticated. Instead, I’m always in search of fun, casual dining in Honolulu, where I can meet a friend and chat over a light lunch. And have a great view. Sure, there are a few chain restaurants or way-too-crowded beachside digs that offer lunch and a view. But, I prefer to hotel hop and try-out their lunch venues by the pool or beach. 1. The Grove (or Passageway) at The Modern Honolulu: What’s especially nice about eating at The Grove is the ambiance. Of course, the dining is al fresco, but the tables are organized along a wide hallway so you feel like you’re part of the hustle-and-bustle of the hotel. Except you’re not. Although The Grove isn’t on the beach, the tables are surrounded by arbors, bougainvillea and hibiscus, which create a garden feel. And, lush banquettes and overstuffed wicker chairs invite you to lounge as long as you want. The menu features salads, sandwiches, and specialties, but each item comes with a twist. For example, the grilled chicekn sandwich I ordered featured proscuitto, melted cheese, and an arugula aioli. To top off the ambiance, all tables have chairs or benches that face the Sunrise Pool and yacht harbor. 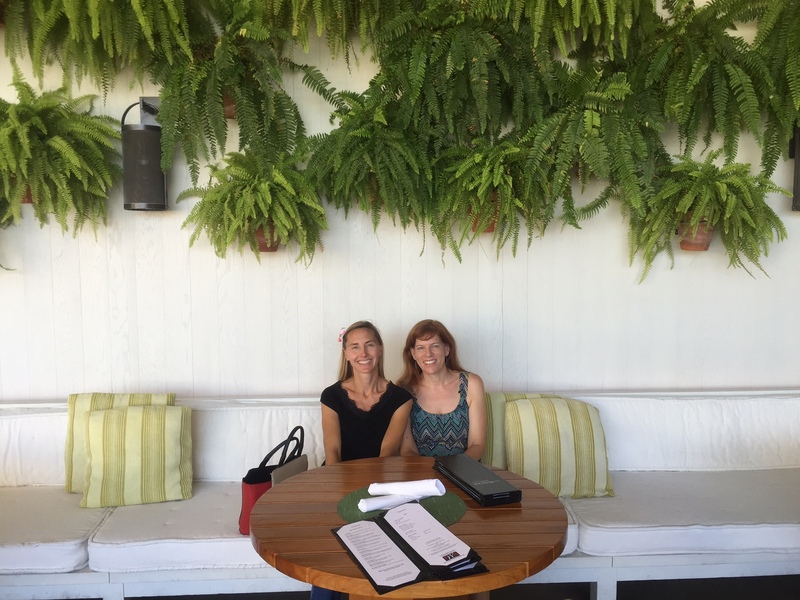 The author and her friend, Andrea, enjoy a light lunch at The Grove at The Modern Honolulu. 2. Shore Bird Restaurant and Beachfront Bar at The Outrigger Reef [haw]Waikiki[/haw] Beach Resort: The Shore Bird Restaurant and Beachfront Bar is an oldie, but a goodie! The restaurant, located at the Outrigger Waikiki is 37 years old and features a vintage-type atmosphere right on the beach. The lunch menu is really fun, with items like Hawaiian Loco Moco, a Pineapple and Papaya Salad with Cottage Cheese, and Island Fish and Chips. At night, the restaurant opens-up its famous grill, where diners can actually grill their own food! 3. Hau Tree Lanai at the New Otani Kaimana Beach Hotel: Don’t let The Hau Tree Lanai fool you! The tables and picturesque lanai may seem uber-elegant, but it’s still fun and casual, especially for the lunch crowd. The venue’s lunch menu features hearty sandwiches, curries, pastas, fresh island fish and vegetarian dishes. And, you have a breathtaking view of the ocean while you dine. Of course, the REAL treat is getting to dine beneath the ancient Hau trees where author Robert Louis Stevenson lounged and wrote. 4. The Beach Bar at The Moana Surfrider: This beachfront casual-dining restaurant is located just steps from Waikiki Beach and features local-inspired dishes, plus fantastic cocktails. In fact, I submit there’s nothing more fabulous than having a fruity cocktail and a hearty lunch just feet from a white-sand beach. At The Beach Bar, you get all that MINUS the big crowds you might usually find at some of the more popular, touristy restaurants. Have your honey chili glazed chicken wings, grilled mahi mahi burger, or waimanalo field greens while enjoying the relaxed, casual atmosphere you’ll find at The Beach Bar. Hotel-hopping is the best way to enjoy lunch with a view in Hawaii. So, check-out these casual and fun venues if you’re looking for a relaxing atmosphere that isn’t too crowded. As you’re sipping your mai tai and enjoying a breathtaking view, you’ll thank me!